So this story has its beginning over a year ago, while I was recovering from my first bout with liver toxicity. Although I am well acquainted with my own mortality, generally I feel as if I am viewing it from a reasonable distance. At times that distance has been measured in months but generally I am confident that I’ve got another year or two (and I reset the clock every morning). However, in the days following the precipitous rise of my liver enzymes, I had to acknowledge that my continued existence is potentially rather tenuous. And I put myself into then fourteen year old Peter’s shoes. I imagined what life would be like for him not only without a mother, but living alone with a father who spends a good deal of time on the road. I realized that it was necessary to, somehow, someway, beef up his support system. Several months later I was on a plane to Colorado for my thirty-fifth high school reunion. Seated next to me were a mother and daughter. The young woman, name Sarah, was a student at Phillips Exeter Academy and she was flying home to the west coast for summer break. The three of us began to talk, and soon I was asking Sarah all sorts of questions. I was so impressed by her intelligence and poise, and by the fact that she portrayed Phillips Exeter as such a supportive community. I realized that boarding school might well provide the haven I was seeking for our son. Soon thereafter Peter and I began the process of applying to private school. And what a process it was. We visited seven campuses and each did eight interviews. Peter took the PSAT’s and SSAT’s. Ultimately we narrowed the field to five excellent schools; all within two hours of our home. With applications due in January, crunch time coincided with the switch-up of my treatment. But, and I’m going to repeat myself—somehow, someway, we did it. Applications, short essays, transcripts and letters of recommendation. All in by the deadline. On March 9th there were two thin letters at the post office. Peter had been waitlisted at Deerfield Academy and St. Pauls. We held our breath. And then he opened an email—he’d been accepted to Phillips Exeter Academy, which, frankly, is one of the best private schools in the world. To say we are excited is an understatement. There is a lot to figure out yet, and financially, this will create new challenges. For Peter, it is the opening up of a fresh world of possibilities. The opportunity to live in a community (he will board), to engage in a plethora of extracurricular activities, to make new friends, all while getting the best education possible. Of course, even as my heart sings, there is a heaviness. We will see much less of this child we adore, as his new school will become a second family. But that’s okay—as they say, sometimes it takes a village. A couple of days ago I got back in touch with Sarah, the young woman from the plane. And I told her how a chance encounter had become so much more. Sarah-ndipity, if you will. This entry was posted in Announcements and tagged children of parents with a terminal illness, lung cancer. Bookmark the permalink. Way to go Mom! Update Linkedin: inspiring public speaker, mover of mountains. Everyone’s future is brighter [expect perhaps that beautiful tank of fish]. Linnea: Hi! I read your blog regularly, and as a fellow survivor, I so admire your strength throughout all these challenges. You inspire me! I just wanted to send a well-deserved “congratulations” to you and your family on Peter’s acceptance to Exeter. What a great opportunity! Celebrate and enjoy. Thank you Valerie—I really appreciate the support and wish you the best going forward. Oh, congratulations! I drive past Phillips Exeter on the way to the hospital and always think what lucky kids they are as they cross the sidewalks! It’s a lovely campus and a cute downtown area – this sounds like a great fit! Bitty, I’m thinking life is going to be pretty fine (if a little bit challenging academically) for Mr. Pete. Excellent news for your entire family. Cheers! Pete says thanks Uncle Johnnie! Hey Linnea- I say you should bust out all that well-earned pride. 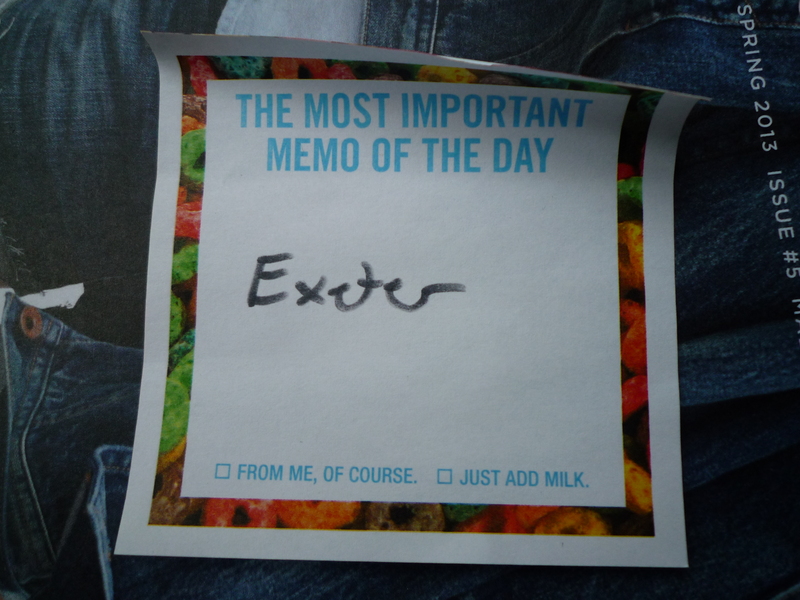 Maybe an “Exeter” tattoo (Times New Roman italic font. For you, not Peter). Or painting 9-foot high letters spelling “Exeter” on your roof so that all passing air traffic passengers may share this important knowledge. Do not do this yourself. Thanks Joan. I will let you design the tat. And maybe invite you over for a roof partie. Dear Linnea – Congratulation, this is a very good news. You are the best and understanding mom for Peter. Peter will have a new adventure and expose to a most valuable life experience. Best wishes to you and Peter. Thank you Joan. I think this could be an amazing opportunity for Peter, and I am so glad it has the potential to be realized. Done DK (the passing of the congrats)—I think scientist is every bit as likely as engineer. When Peter got to spend two days in the MGH lab last summer (trailing the team that was working on circulating tumor cells –pancreatic cancer) he came away with a new appreciation for biology, and how it too is really about how things work. Congratulations to Peter and his parents. Peter will excel. Good luck at Exeter. Thanks Kathleen—we are so excited for him. Kind of feeling sorry for ourselves imagining the empty nest, but not so much so that we would deny him this rich opportunity. you are doing an incredible job taking care of Peter’s needs ~ and it is clear that he is a very bright guy who will do well with this new adventure! Lorraine, this has been part of my ‘bigger plan’—and I’m so glad that all of the hard work and crossed fingers produced the hoped for result. A lot of pressure to have put Peter under (with the very real risk of rejection)—and I am proud of how he handled all of this but of course so relieved to have a happy ending and his belief in his potential reaffirmed. Congratulations to all. While I am only a year into this trying to survive lung cancer mindset, I know that family are at risk of being collateral damage to the battle. Kudos to you all for the futureview. Congratulations to Peter! and you too, Linnea!